All eight coal-mining companies under the Vietnam National Coal and Mineral Industries Group (Vinacomin), listed on the two stock exchanges, have reported larger profits in the first half of 2015. This is good news for the coal sector, despite a reported loss of an estimated 1.2 trillion VND (55 million USD) in the rainstorms and floods in the northern coastal Quang Ninh Province. The torrential rain and floods, the worst catastrophe in the past four decades that began on July 26, have severely affected mining and business activities here. 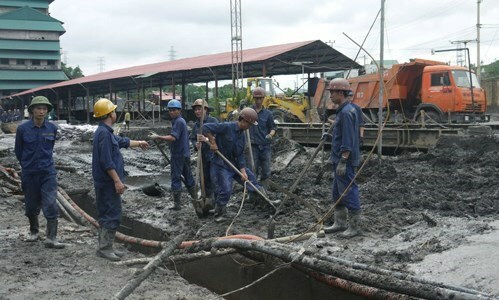 All coal production in Quang Ninh, which is known to have the largest coal reserves, has been halted to focus on prevention of floods and post-flood recovery. Besides the report of the flood damage, Vinacomin said its business continued to grow in the first six months of this year. The group earned almost 56.7 trillion VND (2.6 billion USD) in revenue, up 5 percent year-on-year and equivalent to 49.7 percent of its annual target. As of the end of June, the total revenues of these eight companies was more than 12.3 trillion VND (564.2 million USD), a 10 percent increase over the same period last year. Their total profits reached a combined 111.52 billion VND (5.1 million USD) in the first half, up 140.6 percent over the same period in 2014. However, analysts said a very difficult period is coming for mining companies in the next few months. According to a recent report of VPBank Securities Co, Vinacomin – Mong Duong Coal (MDC) is likely to suffer the most in the ongoing floods in Quang Ninh, as its coal mines were flooded from -250m to -90m, along with damaged infrastructure. The company said it would take three to five months to resume operations.